It was an idea that grew from a chat over coffee and cake in the Café Roma, which in Tripoli, is where all the best ideas take shape. Emma had recently returned to Libya after being evacuated during the 2011 Revolution, whilst I was an enthusiastic new arrival to the country. The obvious challenges of working in a post-war nation aside, for both of us the ‘New Libya’ offered a wealth of developmental opportunities and we were looking for a project to become involved with in addition to our day-to-day duties at IH Tripoli. As EFL teachers, the shortage of teacher training in the Libyan public education sector seemed like something we could positively influence during our time here. Several cappuccinos later and the seeds of the ‘English for Libya’ Teacher Training Project had been sown. The outcome of our initial discussion was a loosely worded project mission statement: “to design and deliver a series of four consecutive teacher training workshops for preparatory and secondary English language teachers at Libyan state schools.” The workshops should “present a communicative approach to teaching vocabulary, reading, speaking and writing, using the core materials of the Libyan National curriculum: the English for Libya (Garnet Publishing, 2008) series”, and would be brought to a close when participating teachers had been observed attempting to use some of the practised techniques in their own teaching contexts. First-hand research was vital to establish the scope of educational contexts in which Libyan state school teachers currently worked. Neither of us had actually set foot inside a Libyan school before and so were in the dark about the resources and facilities that teachers had available to them, not to mention the main issues that were important to them and the challenges they faced on a day to day basis. Gaining direct access to schools wasn’t always straightforward however; at times requiring expeditions to the Ministry of Education for letters of authorisation with proof of our occupational status. Several schools were reluctant to admit us due to concerns about the permissibility of our visit according to changing governmental regulations. Moreover, once inside these institutions, some of the classes we observed had already been ‘rehearsed’ so that students were primed for our arrival. Over the various visits we undertook, however, what struck us the most was the boundless enthusiasm and motivation of both the teenage students, and – perhaps more notably – their teachers of English! At one point we were worried we would not be able to convince enough individuals to give up four valuable Saturday mornings, but it quickly became clear that just the opposite was true. In a country where the majority of government teachers receive no formal teacher training and many are fresh-faced English graduates recruited straight out of university, the demand for such training hugely outweighs the number of opportunities available. In a matter of days we somehow recruited more eager teachers to the project than we could fit into our classroom. 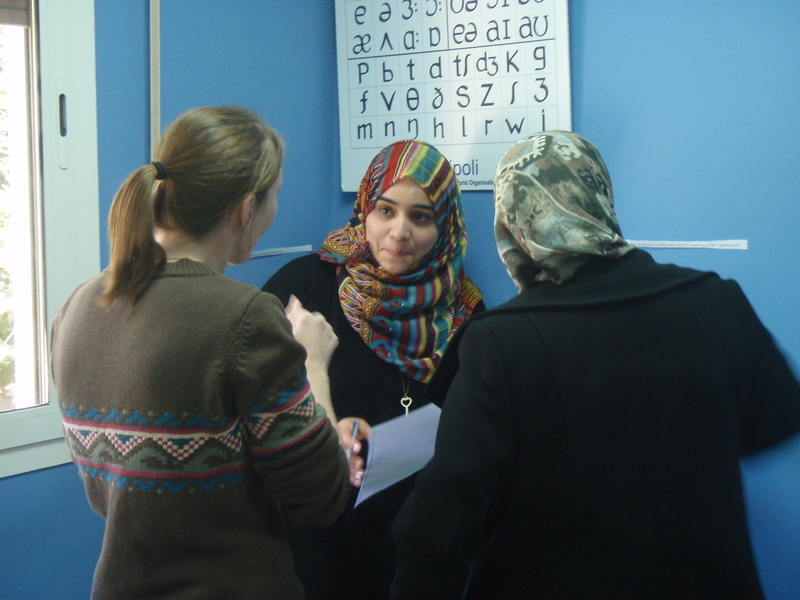 The group was a diverse one, including teachers from a range of preparatory and secondary schools across Tripoli, with varied teaching experience and levels of English (from CEF A1-B2). Aside from their professional backgrounds, all twenty-six participants had one thing in common – they were all women. Libyan society is fairly strictly segregated, a social norm which is extended to many schools. Even though the project was never intended to be such, it was particularly significant for us to have the opportunity to work with the female educators of young Libyan women. With a list of enthusiastic participants signed up and ready to go, we set about planning and preparing training materials. Though they were to be delivered as a series of four, it was agreed that for the sake of the attendees (many of whom were working mothers with family commitments) each workshop would also stand alone, independent of the others. The sessions themselves were primarily skills based, with the exception of ‘teaching vocabulary’. In the spirit of providing training applicable to the teachers’ own contexts, from the beginning of the project we adopted a ‘resources-light’ policy which utilised only the resources that our teachers would have available to them in their educational institutions. In practice this meant no IWBs, computers, CD players or other gadgets requiring an electricity supply; minimal photocopying; and the proscription of any published resources except the standard government coursebook ‘English for Libya’. Accordingly, ‘listening’ was omitted as most of the classrooms we visited did not have access to the course listening materials, nor the facilities necessary to use them. First introduced as part of a curriculum innovation in 2000 (and re-printed in 2008), one of the aims of the ‘English for Libya’ series was to promote a shift away from teacher-centred teaching. In practice, however, student-centred, communicative language teaching methods have yet to be widely implemented in Libyan classrooms and unsurprisingly a number of ideas we proposed in the workshops were met with resistance. Reading aloud (both by the teacher and individual students) is a widespread practice in Libyan schools, and the suggestion that doing this does not actually constitute reading, nor is it beneficial to students’ communication was quite astonishing to some. So too was the proposition that unmarked, error-ridden work might be pinned up on the wall for peers to read, or that writing tasks should be set in class and not only for homework because “there’s never enough time during the lesson!” For one lovely participant, the revelation that native-speaker teachers actually make errors as well apparently came as quite a shock! Feedback on the delivery of the project has been very important to us as first-time, self-appointed teacher trainers. In particular, participants noted how the workshops had helped them with aspects of lesson planning, classroom management, feedback and correction techniques. Though we could not resolve many of the problems faced in their schools (such as mixed ability classes, a lack of institutional support, and the demands of meeting the unrealistic expectations of educational inspectors) we hope the sessions provided simple, practical means to better their teaching in other respects. At the end of the four weeks all the participants agreed to renew their efforts to minimise the use of L1 (Arabic) in class, and to try out some of the new techniques they had been exposed to. To date we have been told of both experimental successes and failures in their application, but by far the most rewarding outcome of the project is the knowledge that our participants’ teaching practice has been revitalised as a result of their attendance. For our part, observing teachers in-situ gave us the opportunity to develop an awareness of the educational system to which many of our students had been exposed over the years, and therefore, a better understanding of our own learners’ needs. When the project came to an end all the teachers received International House Tripoli certificates confirming their presence at the four sessions. For many of them these pieces of paper are the only evidence of teacher training that they have and so they were thrilled to finally collect them. Some of these ladies are already furthering their own language skills by attending General English courses at International House Tripoli and during the next academic year we hope several will complete the Cambridge TKT Exam (currently offered at IH Tripoli) or the CELTA. Finally, we were delighted to learn that one of our participating teachers has also recently been awarded a Fulbright Scholarship to work as an Arabic Teaching Assistant in the United States. Whatever the future holds for them, we wish all of our participating teachers the very best of luck and hope that they continue to enjoy learning and developing professionally throughout their careers. Many thanks to Susan Haghegh (Academic Director) and Eman El Madfai (Director of Studies) at IH Tripoli-Elite, without whose advice and support this project would not have been possible. Author’s Bio: Rose Aylett and Emma Halliday are English Language Teachers from the UK with wide experience of working in the Middle East and North Africa. 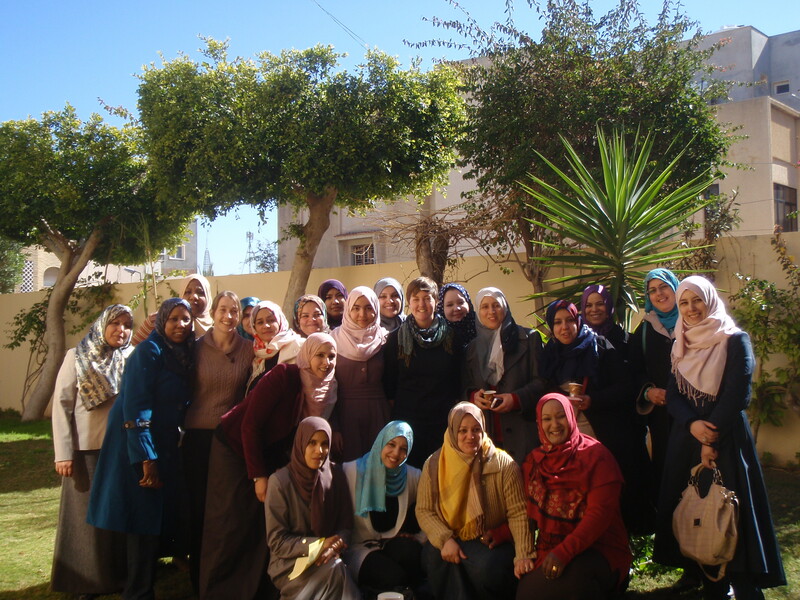 They are currently working at International House Tripoli where over the last six months they have designed and delivered a series of teacher training workshops to Libyan state school teachers. Topics covered include: the core skills of reading, writing, speaking and teaching vocabulary.